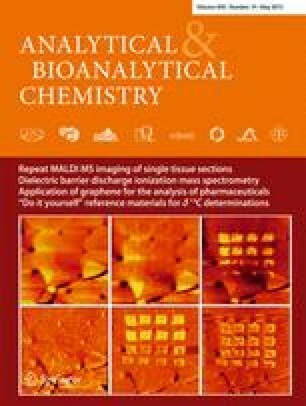 The aim of this paper is to develop a potentiometric sensing methodology for sensitive and selective determination of neutral phenols by using a molecularly imprinted polymer as a receptor. Bisphenol A (BPA), a significant environmental contaminant, is employed as the model target. The BPA-imprinted polymer is synthesized by the semi-covalent technique and incorporated into a plasticized poly(vinyl chloride) membrane doped with the tridodecylmethylammonium salt. The present electrode shows a linear anionic potential response over the concentration range from 0.1 to 1 μM with a detection limit of 0.02 μM, and exhibits an excellent selectivity over other phenols. The proposed approach has been successfully applied to the determination of BPA released from real plastic samples. It offers promising potential in development of potentiometric sensors for measuring neutral phenols at trace levels. This work was financially supported by the Instrument Developing Project of the Chinese Academy of Sciences (YZ201161), the National Natural Science Foundation of China (20977073, 41206087), and the Taishan Scholar Program of Shandong Province (TS20081159).